IntelliJ IDEA 5.0 and later is available now. Use the IntelliJ IDEA Plugin Manager to download and install it. I really like it :). Thank you :). This is what I was always looking for :). A forum or a mail list/newsgroup for the feedback would be by the community also highly appreciated :). 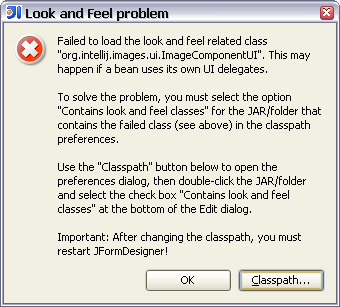 After installing this plugin i have troubles with image open in IntelliJ IDEA. Look screenshot. How it related to JFormDesigner, when i'm just open Image files? will be fixed in the next EAP ;). Thanks for reporting. I'm already working on this bug. The same error message occurs if the "SQL Query Plugin" is installed (failed to load ... "com.kiwisoft.utils.gui.TristateBoxUI"). I'll publish a fix soon. problems and now supports JIDE components.